As I mentioned in my last post, I like experimenting with granola ingredients. My favorite lately has been chocolate and peanut butter – even more addictive than the classic honey granola I posted last time, and a great homemade gift for the holidays. You may want to adjust the sugar and salt depending on the type of peanut butter you use. I prefer Teddie Natural Chunky peanut butter, which is unsweetened but salted. 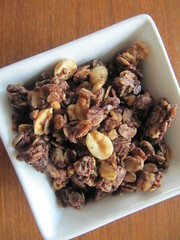 In a large bowl, toss oats, salt, cocoa powder and peanuts. In a saucepan, heat oil, peanut butter, honey, brown sugar, stirring occasionally, until the sugar has dissolved and the mixture bubbles a bit. Remove from heat and stir in vanilla. Pour liquid ingredients into the oat mixture and stir until the oats are evenly coated. Spread oats onto a nonstick cookie sheet. Bake for 10 minutes, then remove and gently toss the granola (if you want chunkier granola, just run a spatula under the granola and gently rearrange). Turn off the oven and put the granola back in for up to an hour to dry, tossing once more along the way. When granola is cool, store in an airtight container. Now the hardest part: try not to eat it all. I just made my usual batch of granola, sat down, opened my computer and saw this recipe. Now I want to throw it all in the trash and make yours instead! Guess I’ll just have to wait until I get some cocoa in the house. @Moni, I will let Santa know! @carfreepvd normal granola has its place too – like, I don’t eat it as fast so it’s actually there when I need breakfast.